We understand the emotions of the car owner attached to the car. The emotional value is equally important as the financial value that’s why some people are unable to sell their car easily. People feel that selling to another owner is easy than selling it to the car wreckers company because they don’t want their car to be wrecked. But, when the time is right the car needs to be sold the cash for cars companies. It’s beneficial for the car owner, cash for cars company that is buying the car and the environment as well. So, how to figure out that your car is ready to be sold to the cash for cars companies? 1. 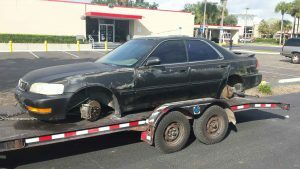 When your car’s condition is not good to run on the road and the repair work would put a hole in your pocket, it is best to sell it to the car removal Perth companies for good cash for car offer. 2. When no regular buyer is buying the car because of its condition. The old unwanted cars are only in demand among the regular buyers only when there’s life left in the car. If the car’s condition is poor no buyer would be interested in that car. The only option you are left with is selling your car to the cash for car companies. 3. When your car is sitting idle in your garage and taking up space, catching rust with time, become home of parasites polluting the environment. This does happen in many homes. People leave their cars in the garage and with time they catch rust and become home for parasites, but they are reluctant to sell it. The wise decision would be to sell the car for good cash for cars offers, free up space in the garage and give the car’s metal a new life because the scrap metal generated by wrecking the car is used as a raw material to make new metallic products. If you or any of your friends are having such car, then this is the right time to sell it for good cash for cars offer and also avail free car removal Perth services from A1 Malaga Auto Dismantlers.